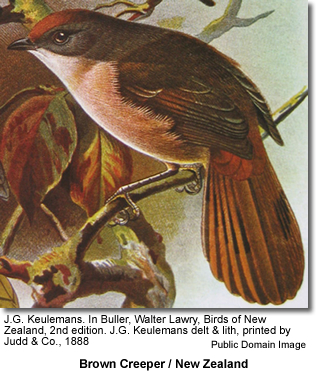 The Brown Creeper (Mohoua novaeseelandiae), also known as Pipipi (in Māori) - is endemic to the South Island of New Zealand. They mostly feed on insects taken from branches and leaves. They have strong legs and toes for hanging upside down while feeding. In the late 19th century, they would occasionally descend on slaughteryards in sheep stations to feed on the meat of butchered animals.